UNITED NATIONS (Reuters) - The Syrian government of Bashar al-Assad is to blame for a chemical attack on the opposition-held town of Khan Sheikhoun that killed dozens of people last April, according to a report sent to the United Nations Security Council on Thursday. 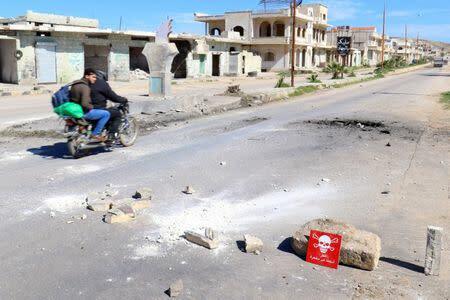 "The Syrian Arab Republic is responsible for the release of sarin at Khan Sheikhoun on 4 April 2017," the report from the U.N. and the Organization for the Prohibition of Chemical Weapons' Joint Investigative Mechanism (JIM) said. The attack prompted a U.S. missile strike against a Syrian air base which Washington said was used to launch the strike. "Time and again, we see independent confirmation of chemical weapons use by the Assad regime," Nikki Haley, the United States' U.N. ambassador, said in a statement. "The Security Council must send a clear message that the use of chemical weapons by anyone will not be tolerated, and must fully support the work of the impartial investigators." The report also said ISIS was to blame for the use of sulfur mustard in the Syrian town of Umm Hawsh on Sept. 15 and 16, 2016. The JIM was unanimously created by the 15-member U.N. Security Council in 2015 and renewed in 2016 for another year. Its mandate is due to expire in mid-November, and Russia on Tuesday vetoed a proposal to further extend its mandate. Russian ambassador to the U.N. Vassily Nebenzia said earlier this week Russia would consider revisiting the mandate extension after Thursday's report is discussed. Speaking in Beijing, Chinese Foreign Ministry spokesman Geng Shuang said China hopes that the conclusions of any investigation have a basis in conclusive proof and are professional, objective and fair. "The continuing use of chemical weapons, including by non-State actors, is deeply disturbing," said the report. "If such use, in spite of the prohibition by the international community, is not stopped now, a lack of consequences will surely encourage others to follow." Syria agreed to destroy its chemical weapons in 2013 under a deal brokered by Russia and the United States. 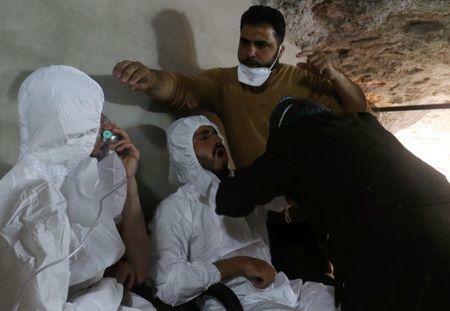 The Syrian government has repeatedly denied using chemical weapons during the country's more than six-year civil war.